Gmail lets you do just about anything with keyboard shortcuts—many of which require just one single key. Usually, the keyboard is faster than the mouse. One approach, however, is easier and faster if you use the mouse and keyboard in unison: selecting a range of messages in a Gmail folder. Working together, the mouse and keyboard let you not only check consecutive messages fast, but you can also uncheck such message ranges from existing selections. Then, acting on—say, archiving or deleting—just the right messages is a piece of proverbial cake. Check the first message in the range with the mouse. Click the checkbox in front of the message. Check the last message in the desired range with the mouse. When the messages are all checked, you can release the Shift key and even select other, nonadjacent messages. Of course, you can also select another range as well and remove individual messages from the selection by clicking their check boxes again. Deselecting a range of messages in Gmail works exactly like that, too. Click the downward-pointed triangle (▾) in the Select button in your Gmail's message list toolbar. ​All: check all messages in the current view. You can then also elect to select all messages in the current label or search results for action (including those not visible on the current page). If you do select all messages, note that unchecking any message on the current page—or a range, of course—will also unselect all hidden emails; the new selection will comprise all emails on the current page minus those you unchecked. As an alternative to selecting All from the menu, you can also click the checkbox in the Select button directly. The keyboard shortcut (with Gmail keyboard shortcuts enabled): *a (asterisk followed by 'a'). None: deselect all messages. Here, too, clicking the checkbox in the Select button is an alternative; it will be filled with a check mark (✓) if all messages are currently selected, and with a minus sign (-) when some emails are checked. Keyboard shortcut: *n.
Read: select all emails marked read. Keyboard shortcut: *r.
Unread: check all new and unread messages. Keyboard shortcut: *u.
Starred: select emails marked with a star (any star will do). Keyboard shortcut: *s.
Unstarred: select all messages not highlighted with any star. Keyboard shortcut: *t.
When you filter based on criteria and you select all the conversations on the page, Gmail will offer a pop-up box next to the Select All box at the top of the message list. This pop-up alerts you that all the conversations on the page have been selected. Next to that message, you'll see a hyperlink to Select all conversations that match this search. If you click the hyperlink, all the messages in Gmail—and not just the ones currently visible on the page—will be selected. Whatever you action you perform will apply to all selected messages. 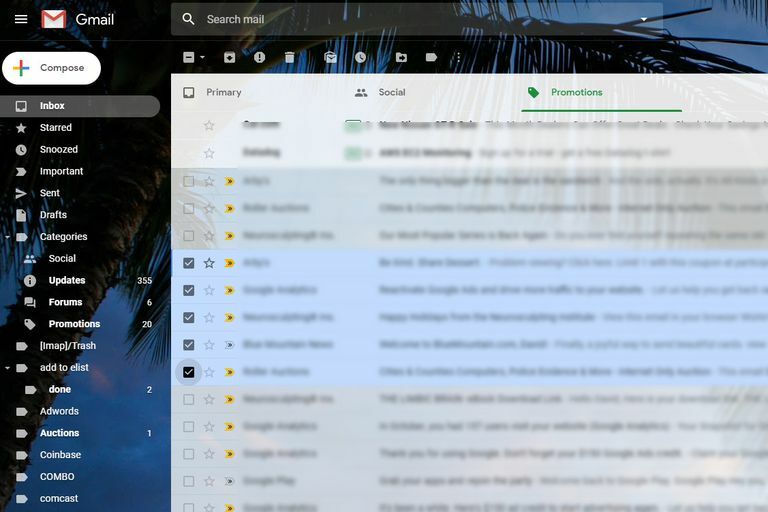 Gmail supports several dozens of different search criteria entered into the search bar, including options to include or exclude keywords, senders, attachments, message sizes, and date ranges. Google's Inbox program uses a different method to select several messages. To select a range, hover your mouse over the photo icon of the sender to reveal a checkbox. Individually click other messages using the same hover-then-select technique—or hover the last message in the range, then hold down the Shift key while you hover-and-select—to check all the messages between the two. Clicking with the Ctrl key depressed individually adds or deletes messages apart from a selected range.